It took 10 posts of the Things About VC series, before he decided to put pen to paper. To put down in words his daily observations and peeves about me. To remind me that I’m as much of a freak as he is. At long last, VC has spoken. Whenever Rere leaves town, we exchange parting greetings. Of course this is customary. Usually you’d expect an “I’ll miss you” or an “I love you” or even a “Take care”. But over the years, I’ve come to expect a little more from Rere. 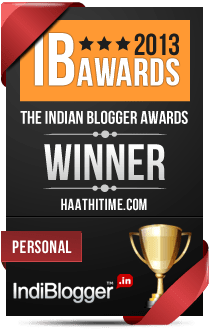 The husband’s first guest post on Haathi Time. Well… this pretty much sums it up. Really. Not joking at all.